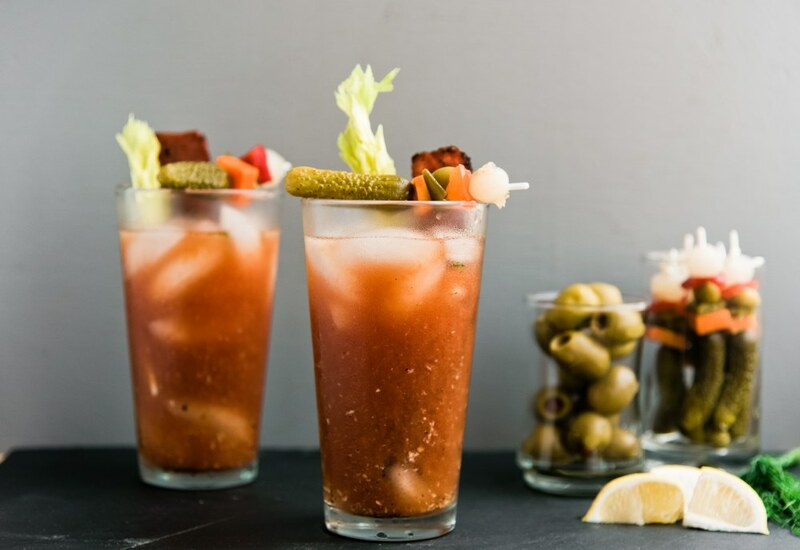 Pickle juice is the secret ingredient that makes these easy-to-make Bloody Marys especially good. Serve them at your next brunch. Make a whole Bloody Mary bar! Mix up a batch of this zesty Bloody Mary recipe and pour into a pitcher. Let your guests pour their own and add more hot sauce, pepper, pickle juice, and especially garnishes! Your guests are going to love you. Stick a crisp dill pickle spear in the glass as a garnish. Or really whoop it up with your garnishes; cornichons, pickled onions, celery, pickled peppers, lemon wedges, and olives on a fancy garnish spear add a nice flair. If you are feeling really adventurous, thread a piece of cooked bacon or grilled shrimp for some savory protein. Really, the options are endless! Per Serving: 182 calories; 1g fat; 12.0g carbohydrates; 1g protein; 0mg cholesterol; 1395mg sodium. Not going to lie, bloody mary's save me during my 'hangover city' moments. I was quite surprised by the umami paste in this drink. It's a flavor you can't quite put your finger on, but it just works in practically anything! I bought "umami paste" at Trader Joe's and have been wondering what to do with it ever since! I don't know if it's the reason that these Bloody Mary's are so dang good but - WOW! I'm giving 4 stars instead of 5 because I wish this recipe was scaled up for a crowd - I served these at a football tailgate and kept having to do math to get the recipe right.